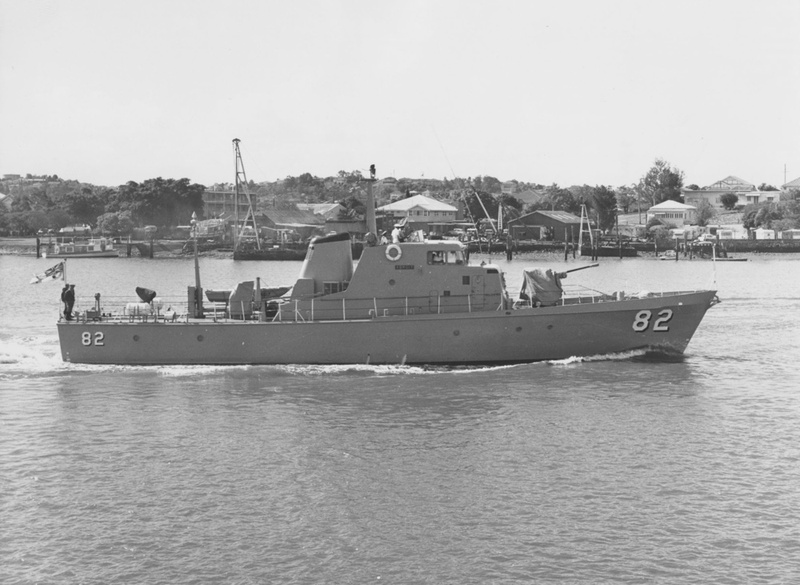 The Attack class patrol boats were ordered following Australia’s involvement in the Indonesian Confrontation when it became evident that the Royal Australian Navy (RAN) lacked suitable patrol-type vessels. Consequently, an order was placed to have 20 Attack class patrol boats constructed in Australia, including five for Papua-New Guinea. The order was placed for the vessels in 1965, for delivery by August 1966, but construction proved slow and the first keel was not laid until September 1966. However, once construction got underway the build time was greatly reduced. The contracts were awarded to two Queensland shipbuilders, Evans Deakin Ltd, in Brisbane and Walkers Ltd, in Maryborough. Both yards had built vessels for the RAN during World War II although no substantial work for the Navy had taken place, in either, since that time. The hulls were of steel construction and pre-fabricated in seven sections while the upper-works were made of aluminium. The Attack class patrol boats proved to be capable vessels and were used chiefly in maritime security and surveillance, boarder protection and fishery patrol duties. HMAS Adroit was laid down and built by Evans Deakin Co. Pty. Ltd. She was launched by Mrs R.I. Peek, wife of the then Flag Officer Commanding the Australian Fleet, Rear Admiral Peek, on 3 March 1968 and commissioned in Brisbane at 11:30 am on 17 August 1968. Appointed in command was Lieutenant Commander G.L. Boyd, RAN and following a brief work up the ship sailed for Sydney in company with HMAS Barbette. After ammunitioning ship, a compass swing and minor defect rectification the ship sailed for the Jervis Bay exercise area in company with HMAS Barbette for work-up trials. Upon completion of these trials, and following participation in an inshore infiltration exercise, Adroit departed for Brisbane, exercising gun drills and small arms during the passage north. On 10 September Adroit attended her first official function, the opening of the container terminal at Port Alma. The guest of honour was the Premier of Queensland. Sir Joh Bjelke-Peterson and on completion the ship returned to Brisbane and from there transited to Sydney. 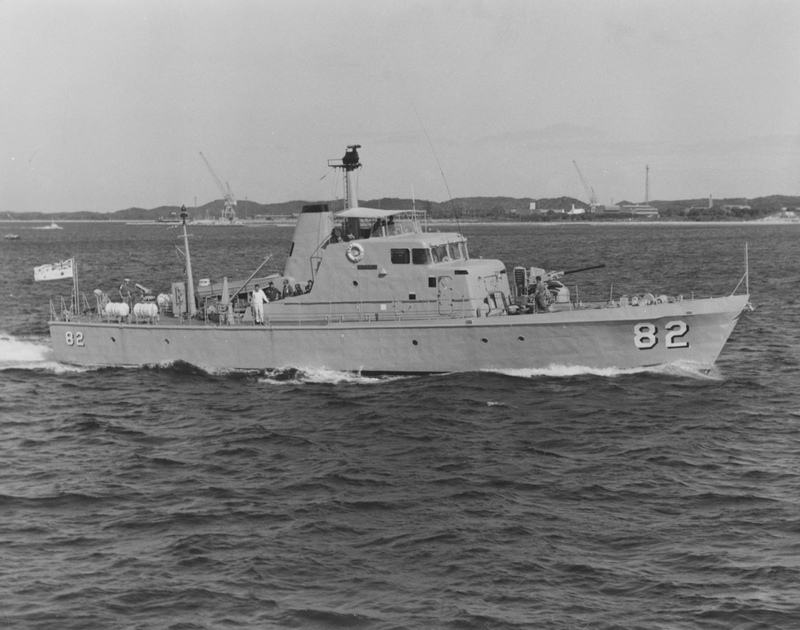 HMAS Adroit as she appeared when part of Australian Patrol Boat Squadron 3 (AUSPABRON3). Note the distinctive funnel insignia. After ammunitioning ship and a compass swing Adroit, in company with HMAS Archer, returned to the exercise area of Jervis Bay where midshipmen from HMAS Creswell joined for training. The ship remained in the Jervis Bay area and on 24 November whilst on SAR duties in company with HMAS Aware she assisted in an attempt to salvage a ditched helicopter from HMAS Albatross. The ship then returned to Sydney before heading northwards to Brisbane, sheltering en-route for one night behind Mutton Bird Island due to severe weather. 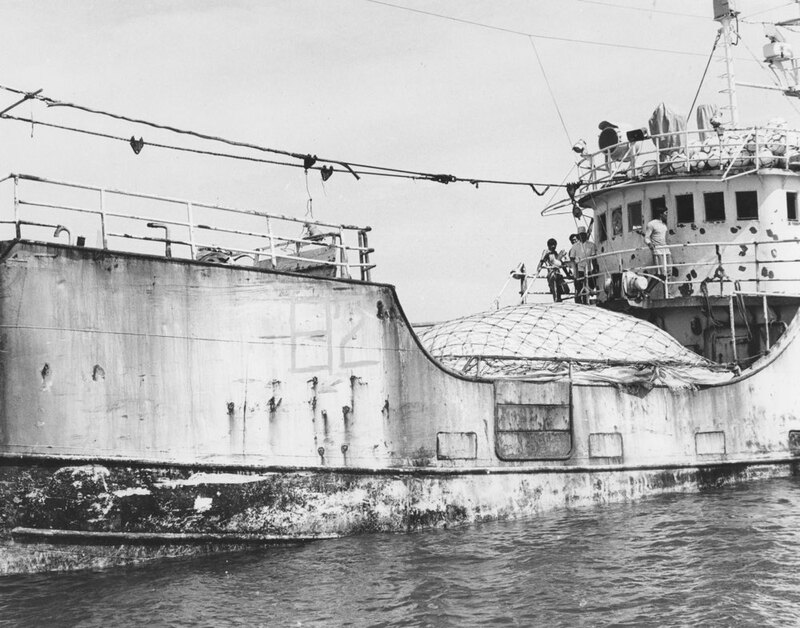 Adroit remained alongside HMAS Moreton, an RAN shore establishment on the Brisbane River, until May 1971 before undertaking Fishery Patrols around the Percy Islands. For the duration of that patrol the vessel was manned by members of the Royal Australian Naval Reserve (RANR) taking part in annual continuous training. The patrol saw Adroit visit Heron Islet, Great Keppel Island, Makay, Scawfell Island, Brampton Island, the Percy Islands, Bowen and Lindeman Islands before returning to Brisbane. Adroit remained alongside HMAS Moreton until February 1972 when she sailed for Gladstone with a mixture of RANR and permanent naval forces (PNF) crew. On 29 February, whilst in company with HMA Ships Archer and Bombard, Adroit incurred damage to the port propeller after striking a submerged tree limb. The ship put into Cairns for repairs before proceeding on to Samurai in company with Bombard. En-route, just south of Bougainville Reef, Adroit encountered very heavy seas, losing one of her life-rafts overboard. On 12 March 1972 Adroit, in company with Archer and Bayonet participated in a ceremonial sail-past at the Port of Alotau. Adroit then returned to Cairns resuming fishery patrols and survey work before shaping course for Brisbane. From June 1973 until 5 May 1974 Adroit remained at HMAS Moreton before undertaking fishery patrols around the Gladstone, Fraser Island, Bundaberg, Percy Islands and Mackay areas. 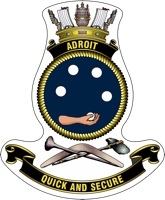 Early June saw Adroit manned with a mixture of RANR and PNF crew conducting night encounter exercises with HMA Ships Archer, Bombard and Buccaneer. The ships later took part in Exercise KANGAROO 1 before returning to Brisbane where Adroit remained alongside until mid-August at which time she departed for Sydney. There she was placed under the command of LCDR P. Ballestry RANR, for a period of annual continuous training for members of the RANR in the Sydney, Broken Bay area. In September Adroit went into a prolonged refit from which she emerged in February 1975, recommissioning at HMAS Waterhen. On completion Adroit participated in sea acceptance and gunnery trials overseen by members of the the RAN Trials and Assessment Unit (RANTAU). 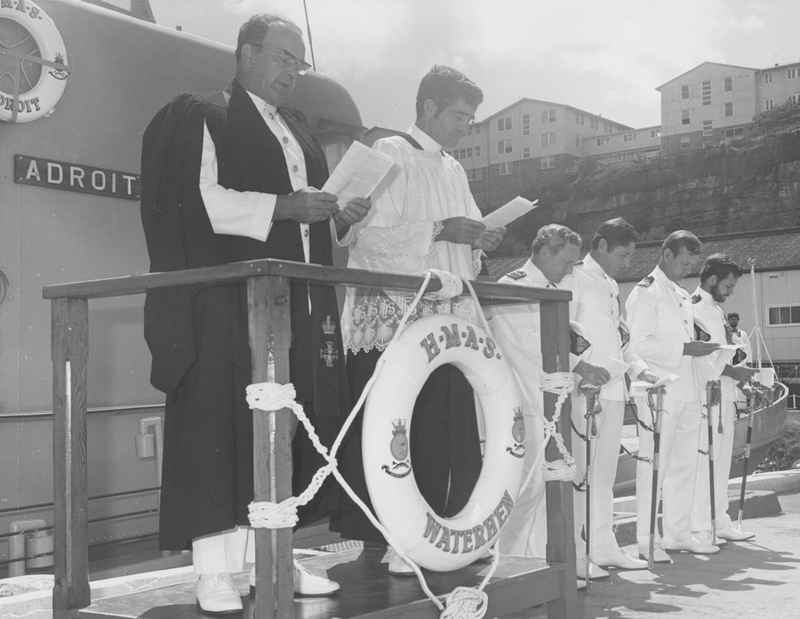 HMAS Adroit was commissioned at a ceremony in Sydney on 17 Feb 1975. Chaplain's W.J. Bates (left) and H.M. McDonald take part in the commissioning ceremony at HMAS Waterhen. Naval officers from left - Flag Officer Commanding the Australian Fleet, Rear Admiral D.C. Wells, Commander J. More, LCDR P. Wright, and the Flag Lieutenant, Lieutenant T.J. Scott. The early months of 1975 saw Adroit conducting exercises in the Eastern Australian Exercise Area before shaping a course for Darwin via Gladstone, Cairns and Thursday Island, arriving in mid-March 1975. On 10 April fishery patrols began in the Port Essington to Gove area of operations. In May, Adroit joined HMA Ships Moresby, Barricade and Buccaneer, for a survey of the Bonaparte Gulf and in the vicinity of Con Bay, Razor Island, Kodan Island, Lesueur Island and Rocky Island. Survey work was often routine in nature and on 10 May a beach banyan and sports day was held on Hidden Island to break the monotony. June saw the continuation of survey work with Moresby in the Bonaparte Gulf before Adroit detached for Darwin for mid-winter leave and to undertake maintenance period. During that time the vessel was manned by a spare crew under the command of Lieutenant C.P. Barr, RAN which responded to a search and rescue call from the trawler Captain A.E. Trivett. Fishery Patrols resumed and on 6 August and two Taiwanese fishing vessels, the Sheh Wei Number 6 and 7 were intercepted inside the Declared Fishing Zone. Both vessels were arrested and escorted to Darwin for prosecution. Adroit then took passage, in company with Assail and Advance, to take part in the annual Broome festival. While there, the ships were placed on immediate notice for sea in response to growing civil unrest in East Timor. Following the festival, fishery patrols were conducted around Ashmore Reef and Baudin Island before returning to Darwin for routine maintenance. Fishery patrols in the north-west fishing zone resumed in October resulting in numerous interceptions of Taiwanese fishing vessels. Regular calls were also made at Broome to embark fuel and stores. On 16 October Adroit was involved in a minor grounding necessitation her return to Darwin for slipping and repairs. By November the ship was back in the water and engaged in fishery patrols in the north-west area until the end of the month. The patrol was punctuated with fuelling and stores stops at Port Hedland and Dampier. December saw Adroit conducting its first Gulf Patrols where the Taiwanese fishing vessel Fu Yuan was arrested for fishing inside the Declared Fishing Zone. She was subsequently towed back to Darwin for prosecution. The Attack class patrol boats provided valuable service to the RAN around Australia in varying sea states and conditions. In 1976 Adroit resumed the normal pattern of fishery patrols seeking shelter on the 9th and 10th of January in Thursday Island from Tropical Cyclone Kim. Once the danger had passed further patrols were conducted during the return passage to Darwin. In May a film crew joined Adroit to document the patrol work being undertaken by the Attack class focussing on the interception of illegal overseas fishing vessels within the declared fishing zones of Australia. This proved a novel experience for both the crew and the media team. June 1976 saw the arrest of more illegal fishing vessels which were escorted into Exmouth. Fishery patrol-work continued in the North West area with welcome respite coming when Adroit’s crew joined US servicemen based at Exmouth for 4th of July Celebrations. Following this welcome interlude several of the crew appeared as witnesses in the trial of the Taiwanese Fishing Vessels Yih Tai numbers 1 and 2. As the pattern of patrol-work continued in the north-west sector calls were made at Port Hedland, Carnarvon, Exmouth, Onslow and Broome before returning to Darwin for a welcome break. On 9 August Adroit returned to the Gulf Area with stops made at Thursday Island, Weipa and Kurumba before heading back to Darwin for rest and recreation. During that time just one day was spent at sea when Adroit performed the role of ‘start boat’ for the Darwin to Ambon Yacht Race. She again performed this duty in September 1976, having been selected as the official start boat for the Cairns Centenary Yacht Race. Participation in Exercise KANGAROO 1 followed where Adroit joined other Attack class boats successfully attacking an amphibious force. A return to Cairns was necessary following an engineering defect that resulted in the port engine being replaced. Upon successful completion of engineering trials the ship returned to Darwin via Gove, Weipa and Thursday Island arresting two Taiwanese Fishing vessels in the Gulf en-route and escorting them to Weipa. HMAS Adroit during one of her many regional port visits. Following Christmas leave fishery patrols resumed in the Gulf area where two Taiwanese vessels, the Huey Maw and Fong Kuo 2 were arrested and escorted to Weipa for prosecution. Patrols continued in the area before the ship returned to Darwin in early February for a self-maintenance period. February saw Adroit back on patrol in the North West Sector calling at Broome and Exmouth before heading south to Fremantle for a three day visit. During the return voyage shelter was sought in Geraldton from Tropical Cyclone Karen before returning to Darwin. Fishery patrols in the Gulf area, Elcho Island and Millingimbi followed during which time the vessel briefly grounded necessitating a return to Darwin where the ship was slipped in April and both propellers and shafts replaced. With repairs complete May Adroit was soon back at sea operating in the North West area where she rendezvoused with two refugee vessels originating from Vietnam. Food and water was supplied to the occupants before escorting both vessels into Broome. May also saw Adroit operating in company with HMAS Moresby, Advance and Bayonet conducting surveys of the Joseph Bonaparte Gulf. Following this activity the ship assisted with a medical evacuation from a Vietnamese refugee vessel taking the casualty to Broome. Later, in June, Adroit was also called upon to assist a Darwin pilot boat which was disabled due to a fire in her engine room. The vessel was taken in tow and recovered to Darwin. Fishery Patrols resumed in July along the Arnhem Coast and the Gulf area resulting in the arrest of the Taiwanese vessel Tai Yin Shang which was apprehended fishing inside the Declared Fishing Zone before being towed back to Darwin. Mid July provided a welcome change of pace for Adroit’s small crew when 20 Australian Army commandos joined her for an infiltration exercise conducted along the coast near the East Aligator River. Following a brief self-maintenance period in Darwin the patrol boat returned to the north-west sector in August calling at Port Hedland, Broome and Point Murat en route. September saw routine patrol work conducted around Ashmore Reef and in the north-west area before proceeding at high speed to Carnarvon on 13 September after a cook on board badly lacerating his leg in an accident in the galley. The vessel then continued on to Fremantle for two days R and R.
In the late 1970s Vietnamese refugee boats were frequently arriving in Australian waters and the Attack class patrol boat crews were routinely being called upon to locate and provide assistance to them. Adroit assisted a number of these vessels and during her return voyage to Darwin in September she assisted yet another in trouble near Vansittart Reef. The vessel was quickly taken in tow to Darwin, where after a brief stop Adroit returned to sea to patrol the northern sector. Having spent many months on patrol Adroit was in need of urgent maintenance and in October 1977 she shaped course for Cairns via Thursday Island to undertake an intermediate refit. On 12 December 1977 Lieutenant J.D. Napier, RAN, was appointed in command and the vessel remained in Cairns until January 1978. HMAS Adroit proceeds alongside on completion of a routine patrol. The new-year saw the crew of Adroit assisting the Cairns Fire Brigade in extinguishing a fire in the cold storage area of Cairns number 1 wharf on 11 January drawing praise for preventing the fire from spreading prior to the arrival of professional firefighters. The refit completed later in the month and on completion Adroit carried out sea trials between Townsville and Hayman Island before returning to the Gulf area and resuming the normal pattern of patrol work. On completion of that patrol she returned to Darwin. Adroit remained in Darwin until mid-February before conducting further post refit trials and patrol work in the Beagle Gulf area. There she rendezvoused with HMAS Ardent for drills and manoeuvres as part of an at-sea inspection by the Naval Officer Commanding Northern Australia (NOCNA). After a brief stop at Darwin she resumed fishery patrols in the Beagle Gulf where 4 Taiwanese vessels were intercepted. Late in the month Adroit, in communication with RAAF maritime surveillance aircraft intercepted an Indo Chinese Origin Vessel (ICOV) with refugees aboard. This vessel was apprehended and escorted to Darwin where it was handed over to the relevant authorities. An Operational Readiness Evaluation (ORE) was conducted in March and later in the month Adroit went to the assistance of HMAS Aware which had developed engine trouble. March also saw a visit by the Chief of Naval Staff, Vice Admiral A.M. Synnot RAN, who addressed the crew concerning the importance of patrolling Australia’s northern approaches. This affirmation of the importance of their often long and monotonous patrol work was welcome recognition from the Navy’s senior leader. Adroit continued patrolling the Beagle Gulf area becoming the first vessel to use the 81 mm mortar to illuminate a contact at night. More contacts were made with ICOV’s 140 nautical miles NW of Darwin and these were subsequently apprehended and escorted before being handed over to local authorities. May 1978 saw the continuation of fishery patrols in the Beagle Gulf area based from Darwin. 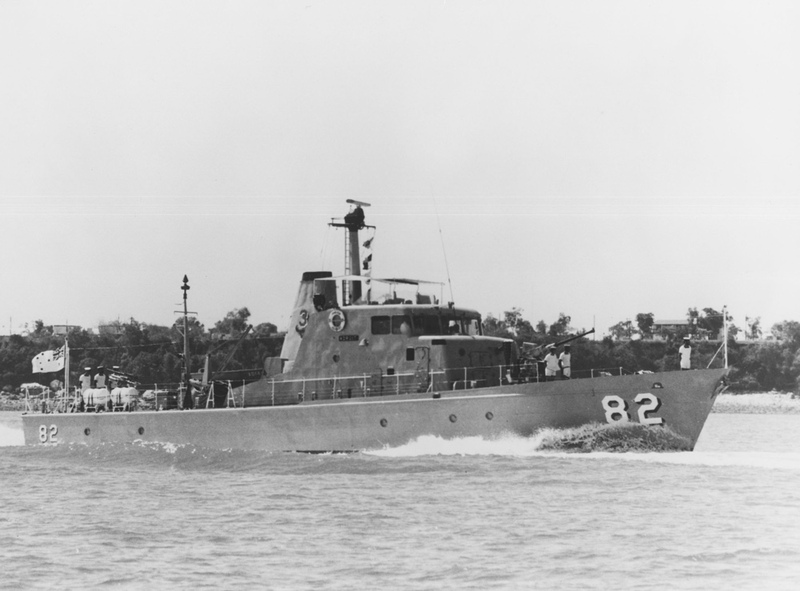 The patrol cycle routinely saw Attack class boats coming and going from Darwin as they balanced routine maintenance schedules with the demands of patrol work in northern Australian waters. In late May Adroit was again at sea in the Gulf area calling at Gove for fuel and supplies mid-way through the patrol. During that visit a member of the ship’s company was admitted to Gove Hospital with a burn necessitating the boat to remain alongside until a replacement crew member could join from Darwin. During May Adroit achieved an impressive tally of 130,500 nautical miles since her commissioning ten years prior. June saw the resumption of fishery patrols with frequent stops at Weipa and Gove. During this patrol Adroit transited through the ‘hole in the wall’, between the islands of Raragala and Guluwuru before returning to Darwin. In July Adroit operated to the west of Darwin fuelling at Broome, Port Hedland and Exmouth before heading south of Rockingham. During this period Adroit enjoyed a break from patrol duties conducting pilotage training with junior officers from HMAS Stuart. During this evolution Adroit touched bottom requiring her to berth at HMAS Stirling where she was slipped for inspection of her propellers and shafts. Upon completion of the docking the ship underwent a compass swing before heading back to Darwin via Exmouth. September saw the ship alongside in Darwin undergoing maintenance and her crew on parade as part of an annual inspection of the vessel. This was followed by Adroit sailing in company with HMA Ships Ardent, Assail and Aware to take part in Squadron Exercises (SQUADEX) where all facets of patrol boat force duties were successfully exercised. The grind of fishery patrols resumed later in the month in the NW area with calls made at Broome for fuel and supplies. During this patrol Adroit was ordered to intercept a Philippine vessel ‘Carlito Flores’ operating in the vicinity of Cuffarelli Island. Following the successful interception the vessel was escorted into Broome and handed over to the local authorities. Fishery patrols were then resumed with a further five Indonesian vessels boarded before the end of the month. During October Adroit operated chiefly in north-west area boarding a further two Indonesian vessels before having to land a sick sailor in Broome and another in Darwin. The high tempo of patrol work continued on into November and it was during this patrol that the boarding of a Taiwanese fishing vessel, Fu Yuan, on 8 November proved to be the catalyst for an inquiry concerning the conduct of a number of boarding operations undertaken by Adroit between April and November 1978. The inquiry resulted in a Court Martial handing down a guilty verdict and dismissing Adroit’s then commanding officer from the service. Taiwanese fishing vessel, Fu Yuan. On 14 November 1978 temporary command of Adroit passed to Lieutenant G. Lloyd, RAN during which time the vessel remained alongside in Darwin. Command then passed to Lieutenant S.H. Hooke, RAN on 21 November who was soon back at sea continuing patrol work. On 28 November Adroit provided urgent medical assistance to the Taiwanese fishing vessel Kao Cheng 21 which was intercepted making best speed towards Darwin and flying the distinctive yellow quarantine flag. The vessel was subsequently boarded and a seriously ill crewman transferred to Adroit and ferried to Darwin where he was transferred by ambulance to hospital. Adroit then resumed her patrol in the Gulf area with a notable rise in morale. 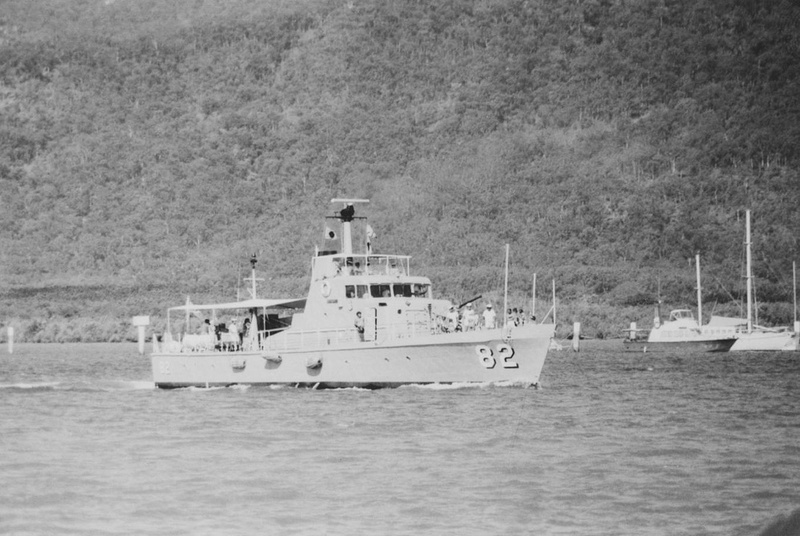 December 1978 was consumed with routine patrol work in the Gulf area with calls being made at Gove, Alyangula and Port Essington before returning to Darwin where a family day was held on the harbour. Adroit then remained in Darwin as ‘stand by vessel’ for the Christmas New Year period. January 1979 saw Adroit at sea in company with HMAS Ardent conducting trials and fishery patrols in the Beagle Gulf. An early return to Darwin proved necessary to evade Cyclone Greta and to attend to lingering engine problems. With repairs completed the normal pattern of patrol work resumed culminating with three interceptions of Taiwanese fishing vessels before anchoring off Fenelon Island. February saw a continuation of patrol work in the north-western area of Beagle Gulf and the conduct of a short exercise with HMAS Ardent before anchoring off Mandorah Jetty and then proceeding to Darwin for scheduled maintenance. Cyclonic conditions again hindered patrol work in March 1979 causing Adroit to seek shelter from Tropical Cyclone Hazel in Broome. By the end of March Adroit had boarded and inspected a further 4 Taiwanese vessels and carried out a successful gunnery exercise with HMA ships Assail and Aware before berthing at Darwin. In April Adroit shaped course for HMAS Stirling carrying out a fishery patrol en route during which two Taiwanese fishing vessels were inspected and a fuel stop was made at Geraldton. The ship remained at Stirling until 19 April before making the return passage to Darwin. On 28April Adroit sailed with 12 members of the 7th Independent Rifle Company of the Army Reserve embark for an exercise on Bathurst Island. The soldiers were recovered the following day and transported back to Darwin where the ship remained for the rest of the month. May saw Adroit operate briefly with HMA Ships Perth, Vendetta, Derwent and Barbette before an engineering defect forced her premature return to Darwin. With repairs completed by early June the ship resumed fishery patrols in the Beagle Gulf and Gulf of Carpentaria calling at Gove for fuel and stores. During that time the ship located a large number of Taiwanese Drift netters, boarding and temporarily detaining one of them. A change of scenery followed in July 1979 when Adroit sailed for the West Coast to participate in Exercise CRABBES FALL with the Special Air Service Regiment. On completion the necessary but mundane fishery patrol work resumed with calls made at Dampier and Port Hedland. The eighteen day patrol resulted in two Taiwanese fishing vessels being boarded before returning to Darwin. August of 1979 saw the ship alongside in Darwin and being visited by Commodore M Hudson and a Parliamentary Committee in regards to the siting of the proposed new Patrol Boat Base in Darwin. Following this the ship patrolled the Beagle Gulf area until the end of the month. The following month saw the ship alongside in Darwin where Divisions were held followed by an annual inspection of the ship. On completion Adroit was soon back at sea in company with HMA Ships Ardent, Assail and Aware participating in Exercise DARWEX 79. On completion of the exercise Adroit returned to Darwin undertaking routine maintenance on the slipway. For the remainder of the year Adroit was an active participant in fishery patrol work around Bathurst Island, the Beagle Gulf and Gove. November saw the apprehension of a Taiwanese vessel which was escorted to Darwin to face prosecution. Assistance was then given to a grounded Taiwanese vessel, the FONG KUO, at Cape Van Dreman. The vessel was successfully re-floated and subsequently repaired in Darwin. Later in the month Adroit returned to Darwin for the trial of a previously apprehended vessel before resuming patrol work in King Sound. There an Indonesian fishing vessel was discovered hiding in the mangroves at High Island, boarded and issued a warning. The ship then shaped course to Broome for fuel and supplies. Departing Broome in early December, patrols of the Rowley Shoals and the North West Cape followed before taking on fuel at Exmouth. The year came to an end with the investigation of a report of a fishing vessel hiding in mangroves. The vessel, the USAHA HIDUP was located and the crew issued a formal warning. Adroit then returned to Darwin for Christmas leave.